American football tight end Evan Engram was a first-round pick in the 2017 NFL Draft. He was selected 23rd overall by the New York Giants and was the second tight end to be selected in the draft. Engram had an amazing college year and was rated as the second-best tight end for the draft by Sports Illustrated and third best by ESPN, and NFLDraftScout.com. Follow us as we take you through Evan Engram’s life journey to football success. 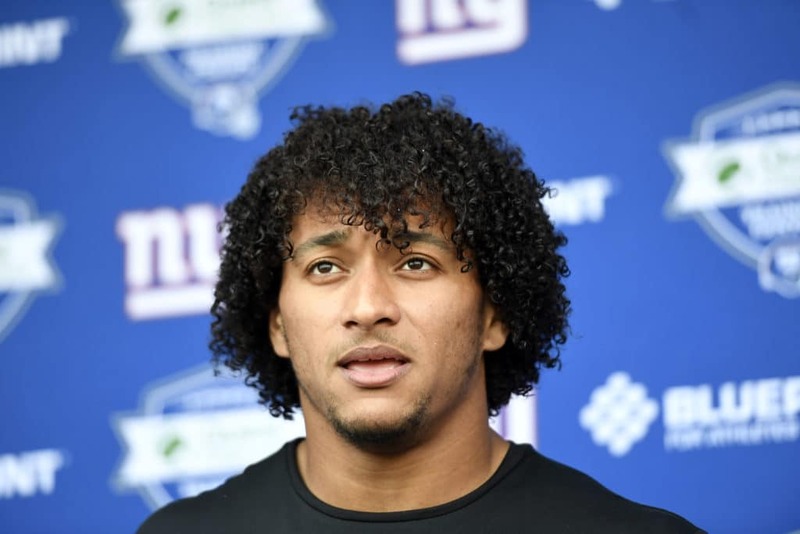 Born Evan Michael Engram on the 2nd of September 1994 in Powder Springs, Georgia, Engram began playing football in his neighboorhood and was among the biggest chaps around. However, when he got into Powder Springs (GA) Hillgrove, he was met with real competition and immediately became an underdog, thus he had to work extra hard to get noticed. Somewhere in high school, Evan sort of lose his way; he began partying too frequently and lying to his parents. Consequently, his game was affected. His mother had come to discover his bad behaviors after getting hold of his phone. A turning point in his life came in his junior year after a heart-to-heart talk with his mom outside a Walmart shop. The talk resonated deep within him and inspired him to get his priorities straight. Evan, right after that discussion with his mom, began a new journey to maturity. Also, his Christian faith was reinvigorated. Evan Engram continued to experience the frustration of not having colleges look his way. However, he persevered and held on to his faith and in time, Ole Miss came calling for his services and Engram committed immediately. He became a starter from his freshman, but soon grew bored of the regular college schedules and became complacent. However, he had a wake-up call when an ankle injury in his freshman year saw him forgo the rest of the season. Engram became more thankful and made up his mind to maximize every chance he got to play. At the end of his collegiate career, Engram recorded 162 receptions for 2,320 yards, a 14.3-yard average. Following his selection in the 2017 NFL draft, he was signed to a 4-year deal worth $10.71 million with all of the money guaranteed and a signing bonus of $5.93 million. Evan Engram has a younger sister Mackenzie Engram who played college basketball for the University of Georgia. She plays in the WNBA for the Atlanta Dream. Evan Engram, besides his athleticism and skills with the ball, has been commended for showing forth an amazing personality chief of which is humility and compassion. The most important people that Engram has to thank for his success and achievement thus far are his parents; his mother, Michelle Zelina and his father, Derrick Engram. His mom is white while his father is of African-American descent. Evan’s parents divorced when he was just 5 years old, however, they remained actively involved in his upbringing, holding him accountable for his behaviors. Engram got his athletic genes from his father Derrick who was a star athlete in his hey-days playing football and basketball. Derrick played at Rockledge High School and was heavily sought-after by colleges across the country. Having so many options perhaps contributed to his career ending right after college. Evan’s father first played college football at Louisville and then Brevard College (now Eastern Florida). Next up was Bethune-Cookman before a return to Louisville. He left again for West Georgia, and then to St. Thomas and Pikeville College before finally settling in Life University, Marietta, Georgia. His hopping from one school to the other earned him the nickname, the traveling mailman. At Life University, Derrick played for the running eagle basketball team from 1991 to 1993. He graduated in 1993 with a Bachelor degree in Business Administration. Post-College, Evan’s father got a deal to play basketball for money but he decided to chase a corporate career instead. Right after graduation, he started out his career as the Asst Director of Minority Recruiting at Life University, a position he held for 9 years before moving on to Pro-Build South to work as their Shipping Manager/Change Agent. He left the job 5 years later in 2011 to join The Leeward Team as their VP of Busines Development and Principal Consultant. He works there to this day and simultaneously consults for DeKalb County Recorder Court. According to his player profile on the official National Football league website, Engram stands at a height of 6 feet 3 inches (1.91 m). His weight measures in at 240 lb which is about 109 kg. Compared to the average tight end’s body measurement, Engram is on the small side but he makes up for his miniature body with an incredible pace. His Pre-draft measurables at the NFL Combine shows his arm length at 33 1⁄2 in (0.85 m) and his hand size at 10 in (0.25 m).